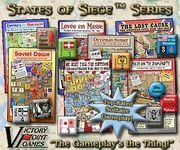 The States of Siege Series, published by Victory Point Games, is a collection of solitaire games in which the player is the commander of a desperate situation. In a States of Siege(TM) game, it is you against all comers in gripping solitaire game action! Surrounded by enemies in every direction, your decisions regarding your scarce military, political and economic resources decide the game. Find out why these games are constantly on VPG’s top-selling products list month after month! Get in the game with a States of Siege(TM) title. formerly on iOS and Android: Zulus on the Ramparts! Ottoman Sunset Gold Banner 2nd edition (didn't get its own entry in the BGG database) (2013). Dawn of the Zeds (Third edition) Premier Line 3rd edition (that includes the Director's Cut expansion from the 2nd edition) (2016).